Here it is! This new version brings a lot of nice changes. You will have to update the old plugin in Lightroom, as it will not work with the new plugin in WordPress. The WordPress plugin should have already been updated automatically to 5+. However, you will have to update the Lightroom plugin manually. The tutorial is here and the new version is accessible in your account, here: downloads. Make sure the Plugin for Lightroom is the version 5.0.0 (or more, of course). A token will need to be generated. In the WP/LR Sync Publish Service, you will need to Logout, paste your token there (there is no login/password anymore), and Login. Any issue? Don’t panic and contact me, we will make it work. And you can always rollback to the previous versions. The old plugin for Lightroom is still available in your downloads, and the old plugin for WordPress is available here, at the end of the page (it is 4.4.8). The biggest change is the new protocol. The former two protocols (XML/RPC and REST) have been totally removed. The plugin now uses its own. It is much faster, uses natural requests without the need extra-encoding, and it is less prone to compatibility issues. Previously, you had to use your login and password. Every time you changed the password, you had to update it in Lightroom as well. That is annoying. Worse, this data was kept in the Lightroom database and was also going through the network. This could be a security issue. Now those potential issues are all over: WP/LR Sync requires a token instead of your login/password. 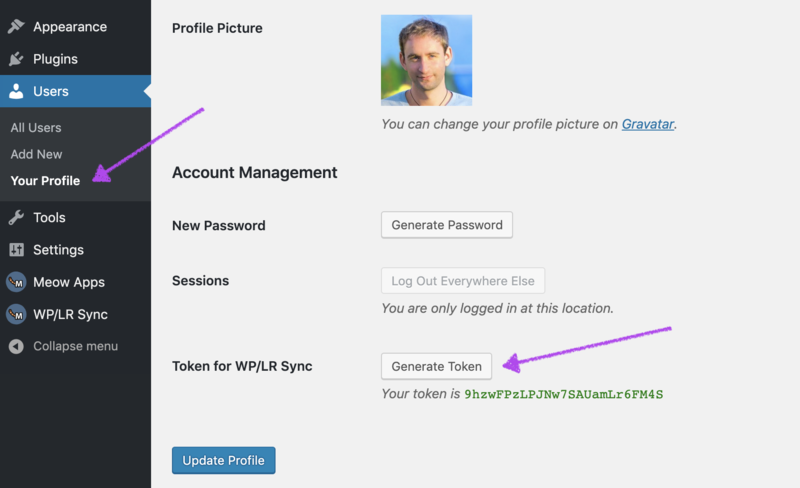 You will have to visit your User Profile on the WordPress side and use the Generate Token button and copy/paste it into the WP/LR Sync Publish Service. No need to ever update it, even if you change your password. And if someone steals your token, it’s not a problem. Please check the new Explorer (actionable through the Settings). It is not a replacement to Real Media Library (if you are using that plugin), but the WP/LR Sync Explorer is really fast, linked directly to the WP/LR Sync database, and works out of the box. 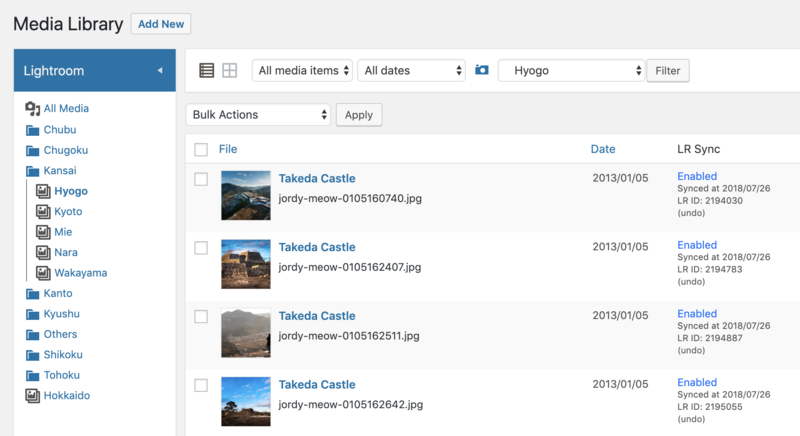 Another cool feature is the possibility of ordering your images within a collection/gallery more easily. Of course, that depends on how you are handling this on the WordPress side, but now WP/LR Sync shares this order with the other plugins if they need. It works perfectly with the standard WordPress Gallery (and therefore, the Gallery Shortcode). Of course, I recommend you to use the Meow Gallery as your gallery system, as it works perfectly with WP/LR Sync. But of course, if any other gallery plugin wants to use the cool features of WP/LR Sync, it is possible (only the developer needs to be willing to do it). There was also a lot of optimization done, along with little fixes, and enhancements. I really hope you enjoy this new version! And if you want to help me and love the plugin, don’t forget that you can review it. Thanks a lot for all your support over the years.